After Darren’s kiteboarding lesson with SoCal Kitesurfing, he was hooked! 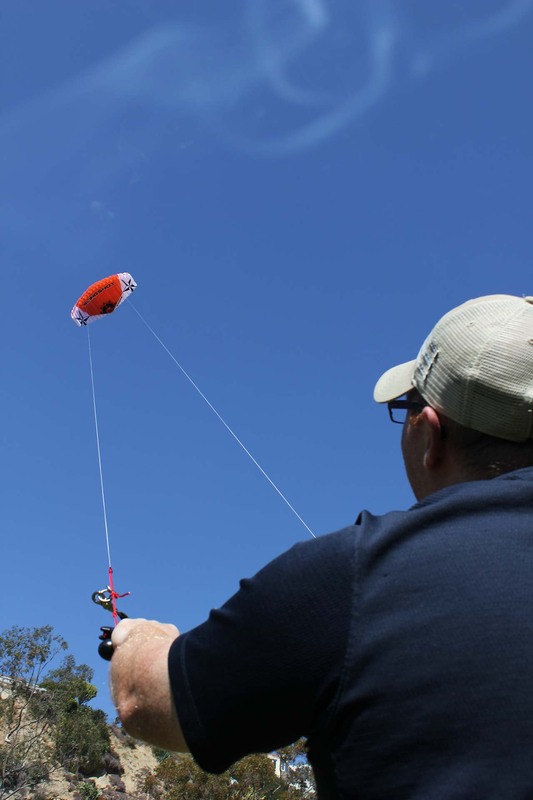 He wanted to practice on a trainer kite before transitioning to an actual kite of his own so we picked up the Slingshot B3 Series Trainer Kite and he and his brother gave it a go on the weekend. Lightweight, compact, and packing a powerful punch in the wind, the B3 is hands down one of the best light traction kites on the market. 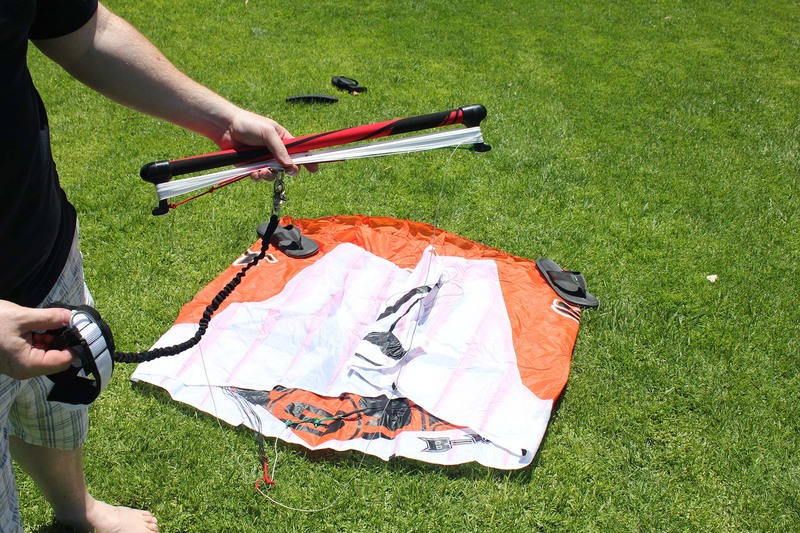 The B3 is Slingshot‘s original 2-line foil light traction trainer kite that features a lightweight aluminum control bar, a compact storage bag, and just the right amount of pull to get you going. The lightweight aluminum control bar has EVA foam grip and is easy on your hands while providing a similar kiting experience to the actual, larger water kites. Most trainer kites don’t include the control bar, making it difficult to practice kiteboarding techniques, but the B3 is ready to launch with all the right gear. The simple design and instructional DVD safely taught us the basics of kiteboarding. 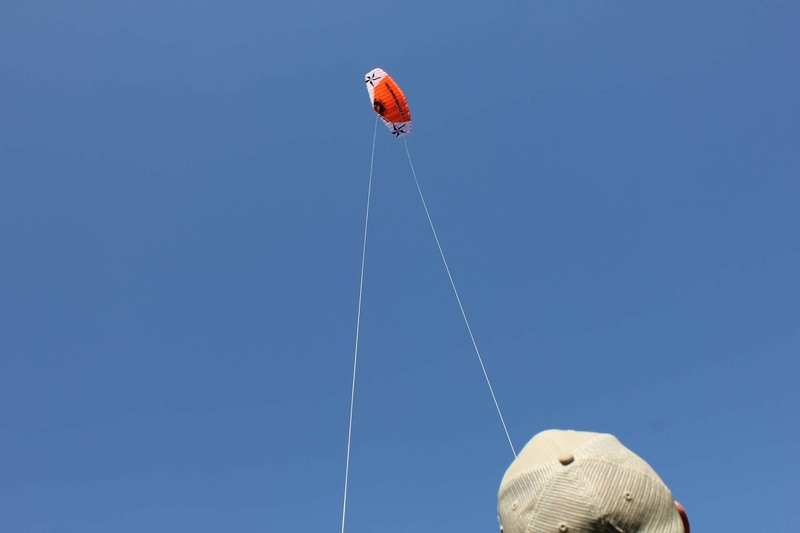 The foil design means that no pumping is required to inflate the kite; the open celled leading edge self inflates into a wing shape upon launching. 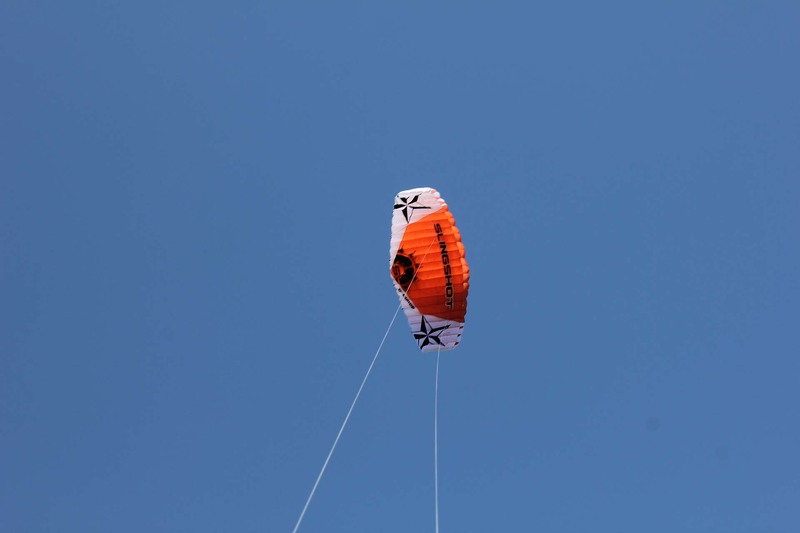 With a 3 square meter surface, the Slingshot B3 generates a good amount of power and the durable material provides peace of mind when you crash the kite. After all, it is a trainer kite and a few crashes are expected. The compact storage bag fits just about anywhere and the light weight is great when you’re carrying other gear. We easily carried it with all of our other beach gear and we didn’t even notice the extra weight. 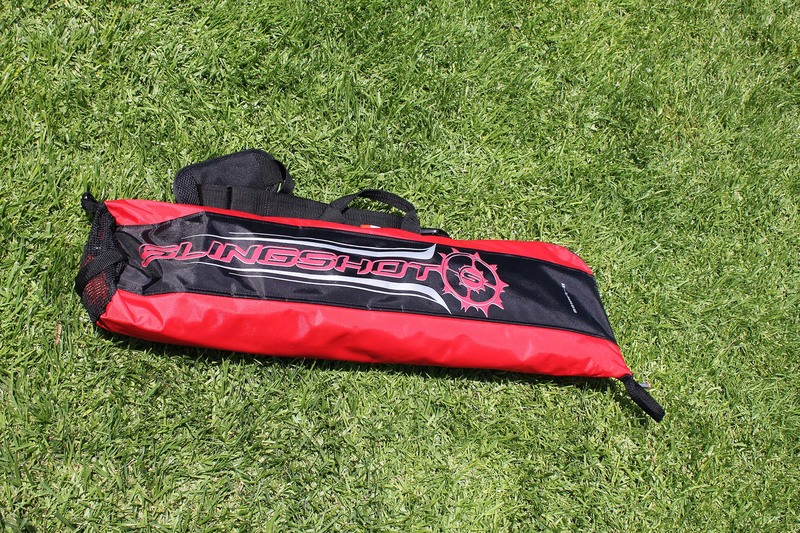 If you think you’d like kiteboarding, pick up a trainer kite and give it a try. It’s a fun way to familiarize yourself with the technique without worrying about the cost. Check them out on Facebook to see some cool photos and extreme videos. This entry was posted in Uncategorized and tagged bucket list, Bucket List Publications, California, kite, kiteboarding, Outdoors, SoCal, southern California, sports, travel, USA by lesleycarter. Bookmark the permalink. This reminds of the movie the “Kite Runner” such a good movie! That looks really good. Sounds like it would be fun and can see why you like it. I’m not the out-doorsey-type but I can see this looks like it could be fun! I could probably just about manage one of these, my daughter has huge 5 and 6 metre one that pull me along! WOOOOOW this is fantastic!!! It seems to be very very fun!!! That looks like an absolute blast! So I originally came over just to thank you for liking my post. My friend and I are slowly producing on our blog. But then i got hooked on reading some of your posts. Great blog! I’ll definitely stay in touch. I, like ktferretti, thought I’d drop in and say ‘thanks’ for liking our blog posts but – man – you sure do know how to grab some attention. Love the simplicity of the post, the photography and content of your message. I think I’ll be peeking in more often. Jumping out of planes? May have to work my way up to that one! 🙂 Thanks for the ‘like’! Hello my friend! Great read! I was just letting you know that I have nominated you for The Lovely Blog Award. You can find all the information you need here! http://vagabondjohn.com/2012/06/03/one-lovely-award/ I really appreciate your writing! It’s incredibly inspiring! Thank you!